We may be heading into winter, but Spring will always be my favorite season in my heart. 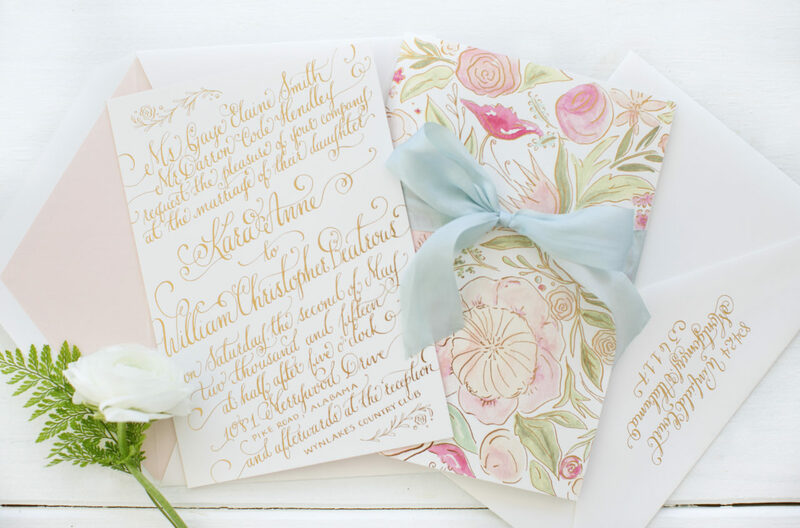 I adore the combination of spring floral illustrations and whimsical calligraphy in these romantic gold foil calligraphy wedding invitations by Kara Anne Paper. Kara designed this invitation suite for her own wedding and incorporated many meaningful nods to her family, including her new family crest and an illustration of her father’s home. What a special invitation suite that will certainly be treasured for a long time to come! From Kara: Designing my own wedding invitation suite came easy! After finalizing our wedding style and color scheme, the late night invitation doodles began. Staying cohesive with all the paper details was important to me. William and I wanted a chic backyard wedding filled with beautiful spring colors and a touch of gold accents. I felt introducing an original watercolor invitation cover was just the perfect touch for our gold foil calligraphy invitation. The invitation was printed on 220# Crane’s Pearl White Lettra with gold painted edges. We also included a tri-fold reply card with our new family crest on the front and an illustration of the ceremony location and reception venue. This design was letterpress printed on 110# Pearl White Lettra. Our special wedding suite was all tied together beautifully with silk blue ribbon and placed inside a Crane’s Royalty envelope. The front of the envelope was graced with gold calligraphy to match the invitation. The wedding program was one of my favorites! The small booklet included a cover page with a pop-up illustration of my father’s house, where I was raised and where William and I first met. To tie the program back in with the wedding suite the cover was a blind embossed printed impression of the same floral pattern used on the invitation cover. 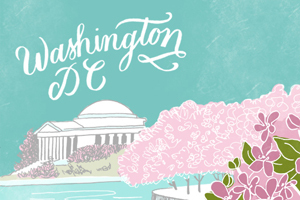 Behind the pop-up, on the inside page was the illustration of the pond and dock where William and I exchanged vows. The pages that followed included the ceremony and wedding party details. Although our rehearsal dinner was indoors we wanted it to have a fresh spring, outdoor feel. We had fresh flowers that matched the watercolor paintings used on both invitations. The invitation was placed inside a wood and glass box with preserved green moss laid nicely on the bottom. The top of the box included the guest names with a pretty blue silk ribbon tied around it. Our closest friends and family were invited so we wanted these invitations to be extra special and personalized.